Gina and Rae Maddox are more like best friends than mother and daughter. Of course, free-spirited Gina’s rambling ways leave her daughter with little opportunity to make any other friends, as they constantly crisscross the country in search of “a fresh start.” But when Gina brings them home to her native Wisconsin, she promises Rae that this time, they’ll stay put...at least until Rae finishes high school. And when Rae begins to make friends at Whitman High, she dares to hope her mother is telling the truth. But then Rae is paired with another new girl, Allison Daly, whose bad attitude and unsettled family life put her at odds with Rae — yet draws her to Gina. When ugly rumors begin to fly about Allison’s past, Rae must choose between distancing herself from the troubled girl or using her own experience as an outcast to help her. The path she takes will not only change Allison’s life, it will affect Rae’s relationship with her mother and her understanding of her place in the world. Life On Hold was a great novel about a girl finally finding a sense of "home", and bonding with her mother. It tells the story of Rae and her mother, who are constantly moving around. As such, Rae never feels the need to make friends or any deep connections. But she's been in Wisconsin for quite some time now, and plans to stay there until she finishes high school, so she feels it's safe to make two friends. Her life is pretty good. That is until a new girl shows up in school that is rumored to have killed her own parents by starting a house fire. From that point onward, Rae's life changes completely, and not always for the better. I really enjoyed reading Life On Hold. It wasn't the kind of novel that I'm used to reading, but I liked it nonetheless. 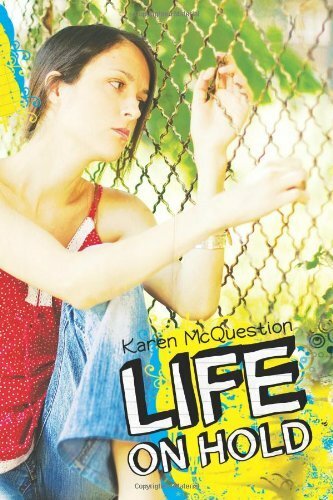 This is my second Karen McQuestion novel, and it made me much more eager to read more of Karen's work. It was a quick novel with good, solid characters and a clean and flowing writing style. Karen was able to create an interesting story in such a short book and I thoroughly enjoyed it. I do recommend this to fans of contemporary fiction. My favorite aspect of this novel was Rae's relationship with her mother. They actually had a pretty crappy relationship, but I really sympathized with Rae as she confronted her mother on the issues between them. It was real. It was raw. There were several instances when I wanted to smack Rae's mom!